Chhattisgarh Public Service Commission (CGPSC) successfully conducted State Service prelims examination and the results of the same were declared. Candidates who had qualified in the prelims are eligible for the CGPSC State Service Mains examination. CGPSC is going to conduct State Service Mains exam from 18th to 21st May 2017. A huge number of candidates who had qualified are searching for the CGPSC State Service Mains exam admit card as it is the crucial document to carry for the exam and contains details regarding exam venue, roll number etc. CGPSC released State Service Main Admit Card. Candidates can download Mains hall ticket from the direct link provided below. The State of Chattisgarh came into existence on 1st November 2000 and Chhattisgarh Public Service Commission was formed on 23rd May 2001. It conducts various examinations for the recruitment of eligible candidates in different departments. This year it has released notification for the State Service exam and the candidates who had cleared the prelims can download mains admit card from the official website. CGPSC released notification and invited online applications for the recruitment of 352 posts in 19 departments. A huge number of eligible and interested candidates applied for the exam. Candidates who had applied can download CGPSC State Service Mains admit card from the direct link provided below. The Main Examination shall consist of the following papers and each paper shall be of Three hours time duration and Interview will be of 150 Marks. Main Examination will be conventional essay type. Question papers for Main Examination will be of Conventional nature i.e; Short/Medium/Long answers Type. All the question papers except first -“Language” may be answered in Hindi or English was chosen by the candidates. How to Download CGPSC State Service Phase II Mains Admit Card 2017? 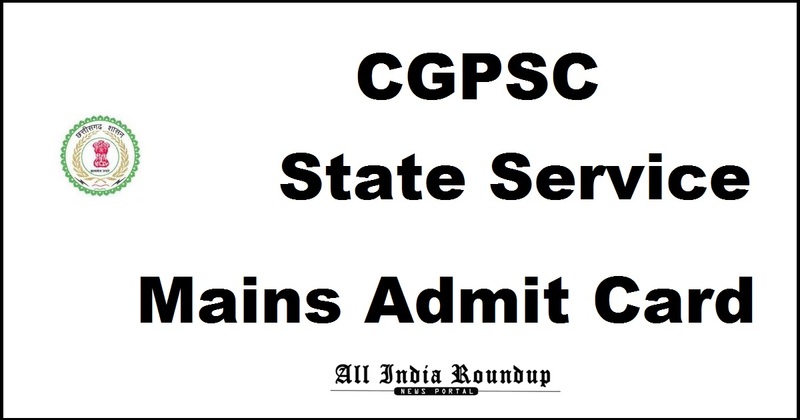 Click on CGPSC State Service mains admit card. Stay tuned to this website. We will update CGPSC State Service Mains results here. Press CTRL+D to bookmark this page for easy navigation.